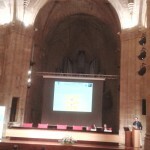 Technicians from the R&D Department of Misturas made a presentation during the last Euro-American Congress on Construction Pathology, Rehabilitation Technology and Heritage Management, Rehabend 2018, which took place in Caceres last May, about their experience in the use of ground-penetrating radar techniques (GPR) at the Aquis Querquennis Roman site, located in Bande (Ourense). Misturas had already had the occasion to present their results from other Research & Development projects in previous years at this top-notch scientific and technical forum, which is held biannually and which took place in Santander in 2014 and in Burgos in 2016. It was precisely in Burgos where the experts from the Ourense construction company defended the potential of GPR in the analysis and inspection of transport infrastructures and subsoil conditions. During this last congress they focused on a specific test for the application of said technology at the Bande Roman site, built between the 1st and the 2nd century during the Vespasian kingdom, most likely to defend via XVIII, a Roman road that connected the modern cities of Braga (Portugal) and Astorga (Leon). The presentation was titled “toGPRi: a processing and visualization tool for 3D-GPR data in the documentation of cultural heritage. Application to the Aquis Querquennis Roman ruins in Bande”, and is the result of a collaboration project between Misturas and the Geotechnologies Applied to Construction, Energy and Industry Research Group of the University of Vigo. Experts from over 60 universities and research centers participated in Rehabend 2018, whose technical conferences took place in the San Francisco Cultural Center, loaned by the Provincial Council of Cáceres. 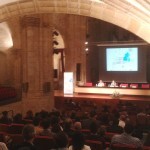 The congress was organized by the Building Technology Group of the University of Cantabria and the EPS of Caceres-University of Extremadura, under the coordination of professors Luis Villegas and César Medina.